This well worn pair has traveled with me on many journeys and walked down many exciting roads! They’ve stepped in puddles and worse, been stamped on, drenched in the rain, splattered with mud, served as bug-home on occasion – and survived! They’ve jumped for joy and danced to music and on occasion have caused painful blisters (but that was when they were young and immature ;)) – rather like the feet in them 😛 Today, almost 5 years after I first bought them – they are still my favorite, trusted travel shoes. I have others, (Of course I do! Girls and shoes – you get the picture ;)), but none that fit or feel quite like these – good, solid, with a rubber sole and a steady grip, they make me feel like I could walk forever. Honestly, I couldn’t ask for a better companion on my journeys! 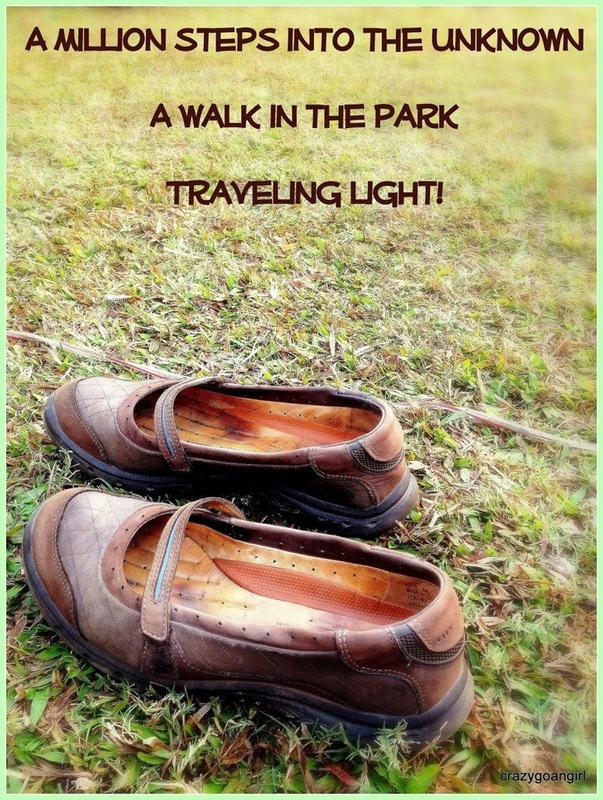 So a trip around the world or a walk in the park – I say…Bring it On! there is always that one pair of shoes that we love!!! Yup!! There always is 😉 Thank you for stopping by 🙂 Appreciate it! Every girl needs a pair like that! Wish you many more great walks and trips with them!